Whereas we believe that a group of college students interested in the field of marketing should organize for mutual benefit, we hereby establish a collegiate chapter of the American Marketing Association which shall be known as the American Marketing Association at the University of Illinois at Chicago Collegiate Chapter. To promote friendly relations between students, faculty, and business people. SECTION 1. Membership shall be open to students of any major who are interested in marketing and any other individuals who are approved by the board of directors. SECTION 2. Any individual approved for chapter membership must become a member of the American Marketing Association national organization. SECTION 3. Any individual approved for chapter membership must be in and maintain good academic standing with his/her respective college at the university. SECTION 4. Any individual approved for chapter membership must be an undergraduate student at the University of Illinois at Chicago. SECTION 5. Membership in the American Marketing Association of the University of Illinois at Chicago Collegiate Chapter is open to all meeting the above criteria, irrespective of race, creed, color, gender, class, age, nation of origin, nationality, disability, marital status, religion, veteran status, or sexual orientation. SECTION 6. If a member does not maintain the requirements for membership, he/she will be required to resign from the chapter. SECTION 7. Members are allowed to take a leave of absence of up to two academic semesters upon approval of the board of directors. He/She must submit a letter to the vice president upon departure, with an explanation for LOA. Upon return, he/she must submit a letter detailing why they wish to return. Members taking a leave of absence are required to maintain membership under the American Marketing Association national organization. SECTION 1. The board of directors shall be the faculty advisor, president, vice president, secretary, director of communications, director of finance, director of membership, director of fundraising, and director of marketing, as well as any other officers deemed necessary by the collegiate chapter. SECTION 2. The board of directors and the chapter officers shall be elected or appointed in the spring of each year to serve the following year. The faculty advisor shall be chosen as provided in Article V.
SECTION 3. All elected officers shall be chosen by secret ballot, and nominations shall be made from the floor. The candidates receiving a plurality of all votes caste shall be elected. SECTION 4. Any board member or other elected officer who fails to fulfill the terms of office or to serve in an agreed-upon official capacity may be removed. Such action shall be effective only upon a majority vote of the board of directors taken at an official meeting called for such purpose. SECTION 5. Any board member or other elected officer must by present at each meeting unless notified and approved by the vice president of the chapter. SECTION 6. In the case that a board member steps down before the first official meeting, the faculty advisor and current board of directors shall appoint a new person for the position so long as they pay for AMA membership and chapter dues. SECTION 1. The president’s duties shall be to preside at all meetings, to appoint all special committees, and to be the chairperson of the board of directors. The president shall also receive and share information from special chapter leader communications from AMA International Headquarters (National). SECTION 2. The vice president shall perform the duties of the president in the president’s absence. In the event of vacancy of the presidency, the vice president shall succeed to the presidency. The vice president is responsible for room reservations for meetings, conferences, and other such events planned by the American Marketing Association at the University of Illinois at Chicago Collegiate Chapter. SECTION 3. The secretary shall keep all records, except financial, handle written correspondence, perform such other related duties as the president delegates, and prepare a written report of each meeting which will be read at the next meeting. The secretary of the American Marketing Association at the University of Illinois at Chicago Collegiate Chapter shall be responsible for recording and maintaining minutes, agendas, and other such records for each meeting. SECTION 4. The director of finance shall collect all collegiate chapter funds and deposit them in an account on behalf of the collegiate chapter of the American Marketing Association at the University of Illinois at Chicago. He/she shall work closely with the director of membership in collecting the AMA national dues. He/she will be responsible for making all necessary expenditures when authorized by the president and faculty advisor, keeping financial records, and submitting a written financial report to the collegiate chapter at the last regular meeting of each semester. The director of finance shall provide the chapter president and faculty advisor with information in a timely manner upon request. He/she will perform such related duties as the president shall delegate. SECTION 5. The director of membership shall provide an AMA student membership application to all potential student members. He/she shall check each application for accuracy, making sure all information requested is given and keep accurate membership records, and a chapter roster. In accordance with the chapter’s determined goals, he/she shall conduct an active and aggressive membership campaign. The director of membership should remind members to renew AMA national membership in the month of their membership expiration. The director of membership can request a chapter roster at collegiate@ama.org. SECTION 6. The director of marketing has responsibility for developing, recommending, and implementing programs for the collegiate chapter. Additional chairpersons may be appointed by the president to handle special programs such as projects and seminars. The director of marketing is responsible for planning guest lecture series, group excursions, workshops, and other events for the collegiate chapter and students at the university. SECTION 7. The director of communications is primarily responsible for promoting the events and affairs of the collegiate chapter to the school, local AMA professional chapter, and local community. He/She is responsible for promoting and maintaining a positive public image of the collegiate chapter through social media, campus, and community outreach. SECTION 8. The director of fundraising is responsible for raising money for the collegiate chapter for events, conferences, and traveling expenses. He/She will be responsible for planning events and campaigns to raise money for the collegiate chapter. SECTION 9. Each board of director is required to submit an oral or verbal report to the members at each meeting to notify the chapter of the work he/she is doing each week. SECTION 10. Each director supervising a committee must submit a proposal of events and budget for the semester, and a year end report at the end of his/her term. SECTION 1. The administration of the college/university shall appoint a faculty advisor who will be the personal representative of the administration. The faculty advisor must be a professional member of the American Marketing Association. In schools where the chapter may select its own advisor, this should be done in conjunction with and approved by the administration of the college/university. Whilst a faculty advisor may serve on the board, he/she does not have voting rights in the chapter. SECTION 2. The advisor will serve for at least one full school year, shall attend the meetings of the collegiate chapter, and shall aid and advise the group on matters under consideration. SECTION 3. The faculty advisor shall be responsible for the continuity of records and other property of the collegiate chapter. SECTION 4. Additional faculty members may be asked to join the appointed faculty advisor whenever the tasks involved make it feasible to have additional faculty representation. SECTION 5. The faculty advisor shall be the official contact with the American Marketing Association Headquarters. SECTION 6. The faculty advisor shall insure the chapter members are also becoming members of the American Marketing Association Headquarters. SECTION 7. The faculty advisor shall insure that the minimum reporting requirements to remain affiliated with AMA are being met each year. SECTION 1. There shall be the following standing committees: the board of directors, the marketing committee, the communications committee, the fundraising committee, and the membership committee. SECTION 2. The board of directors, which consists of all the elected officers and the advisor of the collegiate chapter at the University of Illinois at Chicago, shall decide on the policies of the group, as well as aid and advise the president of his/her duties. SECTION 3. The membership committee, under the supervision of the director of membership, shall enlist all eligible persons desiring to join the American Marketing Association at the University of Illinois at Chicago Collegiate Chapter, and perform such other related duties as the president shall delegate. SECTION 4. The marketing committee, under the supervision of the director of marketing, shall arrange events, workshops, and guest speakers for the American Marketing Association at the University of Illinois at Chicago Collegiate Chapter and perform such other related duties as the president shall delegate. SECTION 5. The communications committee, under the supervision of the director of communications, shall function as the promotion committee for the the American Marketing Association at the University of Illinois at Chicago Collegiate Chapter. All members of this committee shall utilize Facebook, Twitter, Instagram, and other social media outlets to promote events and uphold a positive image of the organization. They shall act as photographers at events, graphic designers, website designers, and perform such other related duties as the president shall delegate. SECTION 6. The fundraising committee, under supervision of the director of fundraising, shall raise funds for the American Marketing Association at the University of Illinois at Chicago Collegiate Chapter through events, activities, and other legal and appropriate means as outlined by the university’s rules and regulations They shall raise money to provide funding for events, travel expenses, and shall perform such other related duties as the president shall delegate. SECTION 7. The president shall appoint any other committees as deemed necessary. SECTION 1. 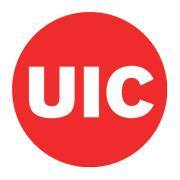 The records of the University of Illinois at Chicago Collegiate Chapter shall consist of a minutes book, membership records, and financial records, as well as any other such records as the chapter deems necessary. SECTION 2. The secretary of the American Marketing Association at the University of Illinois at Chicago Collegiate Chapter shall be responsible for recording and maintaining minutes, agendas, and other such records for each meeting. SECTION 3. If the secretary is not present at a board of directors or general body meeting, the Vice President shall be responsible of maintaining the secretary’s duties. SECTION 4. Each director presiding over a committee is required to submit a handbook of resources for the next elected officer in their succession. This should be submitted with the end of year report at or before the last meeting of the year. SECTION 1. The constitution, together with the bylaws, shall constitute the operating basis of the chapter. SECTION 2. The constitution may be amended by a majority vote of the members present, with proper notification having first been given to the entire membership. SECTION 3. Bylaws may be added or amended by a majority vote of the members present, with proper notification having first been given to the entire membership. These items are considered to be AMA policy and must be included in the constitution and followed by the collegiate chapter. NUMBER 2. American Marketing Association at the University of Illinois at Chicago Collegiate Chapter’s dues shall be $0 per year, paid to the director of finance, whose responsibility it will be to hold the collegiate chapter dues, and send the accurate amount to AMA Headquarters with correlating membership applications. Checks may be made payable to the American Marketing Association. NUMBER 3. A copy of the constitution of the American Marketing Association at the University of Illinois at Chicago Collegiate Chapter shall be provided for each member of the board of directors. The constitution will be reviewed annually to ensure that it is in keeping with the needs and activities of the collegiate chapter. NUMBER 4. The number, location and times of meetings shall be determined by the board of directors. The vice president is responsible for reserving a room for all meetings, conferences, and other such events. Notice of all such meetings shall be posted or sent in writing to all members not less than five days in advance of the date set for the meeting.